In a world where more and more communication is done via some type of screen, is it any wonder that social anxiety is the most commonly diagnosed anxiety disorder in 2018? While those who don’t suffer from it may laugh it off as just being awkward around others, those who deal with this issue on a regular basis understand how devastating it can be. If you are looking for a way to move past your personal anxiety issues then Social Anxiety: Influential Techniques to Always Make a Good First Impression and Impact How You are Perceived by Others is the one-stop guide that will teach you how to free yourself from social anxiety and make an excellent first impression. Social anxiety isn’t caused by any one personal issue and is instead caused by a mixture of biological and environmental factors, typically with a dose of traumatic experience thrown in for good measure. As such, there is no one way to treat it, because your social anxiety is as unique as you are. To that end, this book is filled with dozens of in-depth tips and tricks that you can try to help you deal with whatever personal issues that may be causing your social anxiety. The techniques are a mixture of practical things you can do to feel more at ease in social situations as well as mental exercises designed to help you leave the mindset that encourages your anxiety behind. If social anxiety adversely affects the quality of your life, Now is the time for you to free yourself and create positive changes, stop dreaming about making a difference and start making your dreams a reality. A detailed breakdown of common body language and what it means to give you an insight into what the people you speak with are thinking. Easy but powerful techniques to help you take control of any conversation. The differences between a fixed mindset and a growth mindset and how to turn the former into the latter. The importance of SMART goals and why you should start using them today. Just Click “Buy Now” And Set Yourself On The Right Path To Overcome Your Fear Of Social Anxiety! This book authentically availed me understand the causes and triggers of most of my convivial anxieties. It gave me the implements and strategies that are obligatory to deal with some of my quandaries from the root. The case studies were categorically enlightening. I don’t accede with all of the advice, such as rehearsing conversations, but I cerebrate readers are discerning enough to ken what will work for them. I highly recommend this for anyone who suffers from convivial anxieties and/or panic attacks. 5.0 out of 5 starsHighly recommended!!! I really enjoyed this book. This was a good book for those people who do struggle with Social Anxiety. This book has helped me become more Influential Techniques to Always Make a Good First Impression. The strategies given in this book have been a great help also. This book is very well written by the author and i highly recommend this book to all of you guys. It gave me the actualizes and techniques that are compulsory to manage a portion of my scrapes from the root. I had never truly pondered. 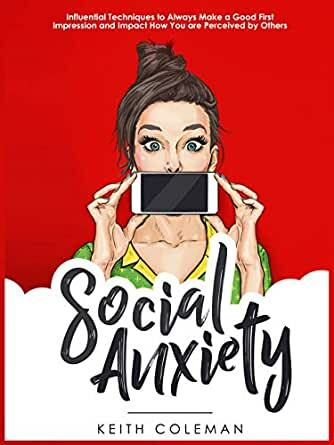 I felt this book truly separates the uneasiness issue and enables you to figure out what causes your tension, This book is great and it contains a ton of new and successful advances and data about Social Anxiety. 5.0 out of 5 starsGood information! This cookbook helps me to understand all the main benefits of the first impression and how to do it resultative. Earlier I have purchased a lot of Social Anxiety books but this one I liked much more. I tried all the tips that have learned from this book and used it in my everyday life. Thanks to the author! 5.0 out of 5 starsHelpful and useful book. This is a very helpful and useful book.From this book you will find a detailed breakdown of common body language and what it means to give you an insight into what the people you speak with are thinking,easy but powerful techniques to help you take control of any conversation and much more.I hope this book is able to help you very much.